The Claudia Taylor Johnson Band had 18 members earn chairs in the Texas Music Educators Association All-State Band or All-State Jazz Band for 2018-19 — including eight who were first place in the room following Area E auditions and two who were first in state for jazz. The total was the most ever for CTJ, with the previous high being eight. Both Juan and Isaac placed first in an extraordinarily competitive audition process. Only four alto saxophonists, and four drum set players from the entire state advance to the TMEA All-State Jazz Bands — and CTJ’s two students placed first in the process. Isaac is also Johnson’s first band member to place in both the Concert percussion and Jazz drum set side of the process. In November, a record 32 Claudia Taylor Johnson band members — including 13 who made first chair — advanced to the TMEA All-Area Band. Two weeks earlier during the first audition round, Johnson placed 50 band members into the TMEA All-Region 12 Band, and another 19 students into the TMEA All District Band. 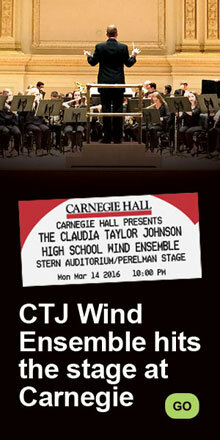 Ten CTJ band members hold first chairs in the Region 12 band. 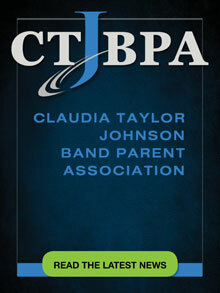 Since the school’s opening in 2008, CTJ has had 45 band members earn chairs in the TMEA All-State bands, gathering a total of 66 chairs over that period. 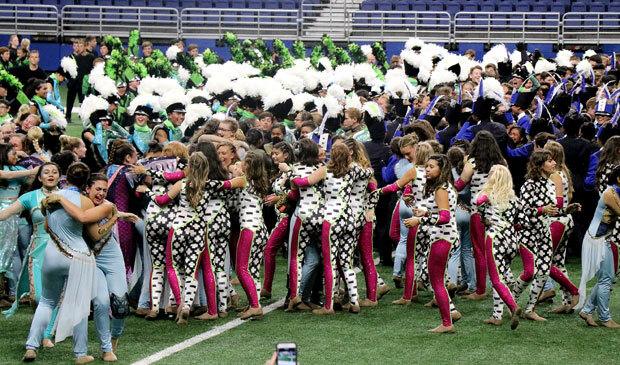 CTJ band members, colorguard, and dance squad (white plumes) rush Vista Ridge following retreat to congratulate them on winning the UIL 6A State marching gold medal following finals competition. 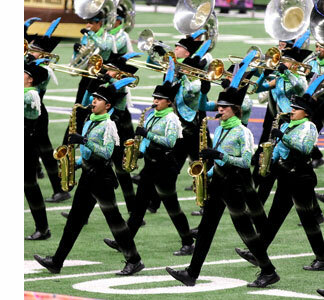 The Claudia Taylor Johnson Marching Band made its last two runs of 2018 at the UIL 6A State Marching Contest, finishing seventh out of 12 finalists performing in the season finale at the Alamodome. Vista Ridge was the gold medalist, getting “1” placements from three of the five finals judges for its music and marching performance. The 6A silver medalist was Flower Mound, and the bronze medal went to Vandegrift. Sister NEISD school Ronald Reagan finished in sixth place. In preliminary competition, Johnson had an energetic performance of its 2018 show, “Tremendous Sea of Love,” and was in fourth place heading into finals, ahead of Hebron, Reagan, and Leander. 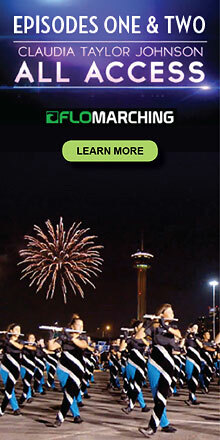 Flower Mound was the top band after prelims. 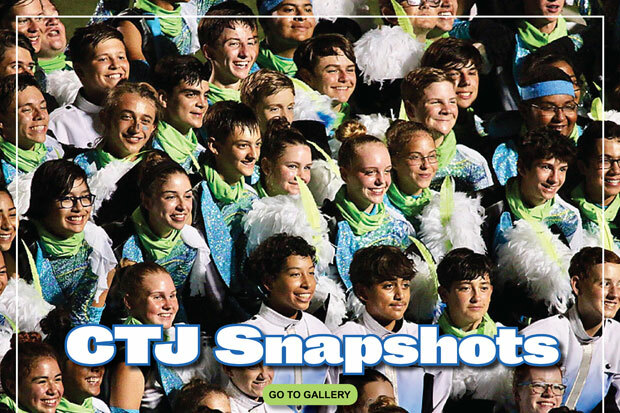 For CTJ, the 2018 season was another successful one, winning two Bands of America regional championships and its 11th consecutive sweepstakes award at the UIL Region 12 contest. Johnson also recorded its eighth consecutive Top Five finish at the BOA San Antonio Super Regional, held just two days before the UIL state marching contest. Just one week earlier at UIL Area D competition, Johnson’s third-place finish ended one of the more remarkable runs in recent marching band history. CTJ had won six consecutive competitions — including five straight Bands of America competitions — going back to the beginning of the 2017 marching season. 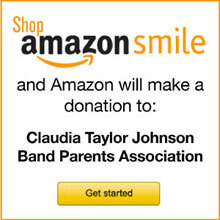 The Claudia Taylor Johnson Marching Band recorded its third-best score in program history during finals competition with a spirited and crowd-pleasing performance of its show, “Tremendous Sea of Love,” to finish in fifth place at the Bands of America San Antonio Super Regional Championship. Johnson’s score of 94.725 in the familiar Alamodome venue continued the program’s incredible record of consistency in the super regional event — an eighth consecutive Top Five finish in what is considered one of the toughest competitions on the BOA schedule annually, earning it the nickname, “The Grand Nationals of the South.” Eight straight Top Five finishes ties Marcus (2005-2012) for the most in the event. Flower Mound placed first out of the 14 finalist bands with a score of 96.600, followed by CTJ’s NEISD sister school Ronald Reagan (96.400), Hebron (96.050), and Vista Ridge (95.575). Since 2014, only two schools have won the BOA San Antonio Super Regional — Flower Mound (2015, 2016, and 2018) and CTJ (2014 and 2017). Johnson’s score in preliminary competition, 94.125, ranked as the fifth-best in program history. CTJ was fourth in Class AAAA and fourth overall heading into finals. CTJ will perform next in the UIL 6A State Marching Contest preliminary competition at 7:15 p.m. on Monday back at the Alamodome. 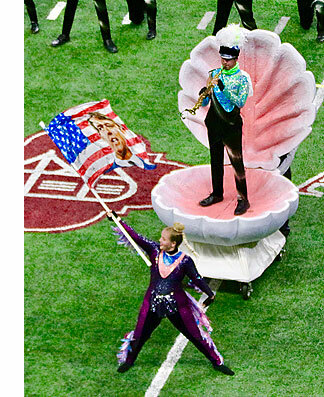 The Claudia Taylor Johnson Marching Band won its fifth consecutive Bands of America championship on Saturday, capturing first place in the finals competition at the BOA Austin Regional at Kelly Reeves Athletic Complex in Round Rock. 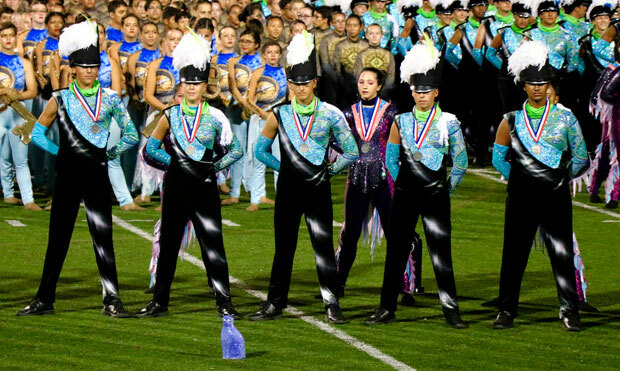 Johnson’s finals score of 83.75 was more than a half-point better than second-place Leander (83.10). Vandegrift (82.30) was third, followed by Vista Ridge (82.05) and James Bowie (80.05). CTJ was also awarded Outstanding General Effect in finals for its 10th anniversary show, “Tremendous Sea of Love.” In preliminary performance, Johnson was named the Class AAAA champion, winning the captions for Outstanding Visual Performance and Outstanding Music Performance. 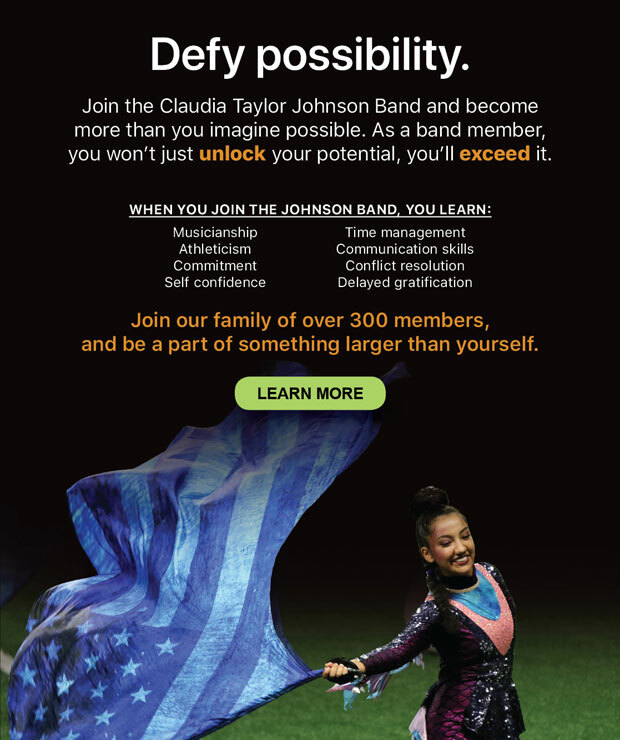 Since the beginning of the 2017 season, Johnson has been awarded 24 out of a possible 30 captions in Bands of America events. 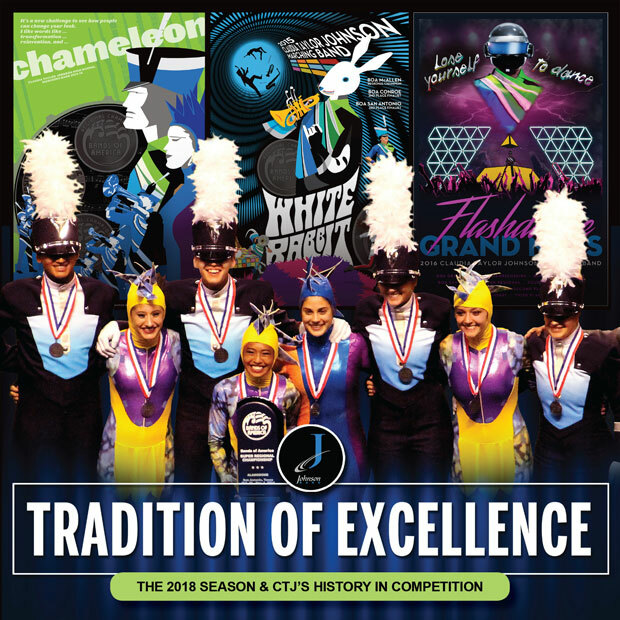 The win was CTJ’s eighth BOA super regional or regional championship, all since the beginning of the 2014 marching season. 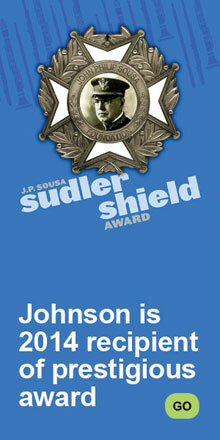 Johnson will perform in competition next on Saturday, Oct. 20, at the UIL Region 12 Marching Contest at Heroes Stadium. Six members of the Claudia Taylor Johnson Jazz Band program have been named to the Texas Music Educators Association All-Area/All-Region Jazz Band following auditions this month. Those honored are: Isaac LaVigne, senior, drum set; Juan San Miguel, junior, alto saxophone; Hondo San Miguel, sophomore, baritone saxophone; Connor Tipton, senior, trumpet; Eli Canales, junior, trombone; and Tanner Clemmons, sophomore, guitar. These six students will perform with the TMEA All-Region Jazz Band in late January or early February 2019. They will have the opportunity to audition for the TMEA All-State Jazz Band in a few weeks.